Village of the Year- Bolton-By-Bowland Will be appearing on Channel 4's Village of the Year 2017 on Tue 6th February 2018 | 3pm and hope to be selected for the Semi in the Northern Zone | Northern Zone Semi Final: Friday 9th Feb 18 | 3pm, Grand Final: Sat 10th February 18 | 8pm. 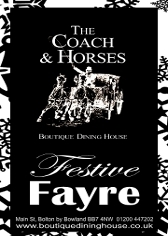 Coach & Horses - June 2017 - After 9 months of intensive work, creating 7 beautiful rooms, a copper clad bar, cosy restaurant, new kitchen and beer garden they reached the end of the project and the Coach & Horses opened its doors to old and new friends. The in-house microbrewery complements the artisanal approach to restore the Coach and Horses in its old glory. 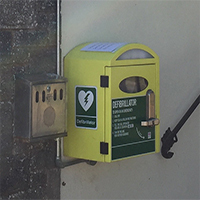 Village Defibrillator - April 2016 - Defibrillator now installed to the side of the village information centre. Please ensure people are aware of its location incase it's ever needed. Parishes in the Forest of Bowland - On our website we outline the role of the Parish Council, with details of our councillors and committees. We provide you with dates of our meetings and copies of agendas and minutes, finances, codes of conduct and other matters of importance in The Parish. We also show you some of the amenities and local services in the Parish. Cricket club 100 Winners - The last draw for the 100 club was held last Friday for the quarter beginning 1st August and the winners were 1st D Johnson £120, 2nd Kate Brunskill £60 and 3rd Graham Greenwood £20. Please will you make the usual announcement and thank everybody for their continued support. Mongolia / Siberia motorcycle adventure - 2014 - Good luck to Frank Baines who starts the 15,000 mile round trip on Sunday 29th June on an endure motorcycle adventure with three friends traveling across Europe and Russia, into Mongolia, then back into Siberia, round the west side of Lake Baikal then east along the infamous BAM road. 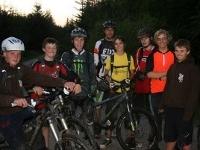 Follow their blog for the latest updates http://rooskiriders.blogspot.co.uk. Cricket club 100 Winners - The last draw for the 100 club was held last Friday for the quarter beginning 1st May and the winners were 1st Rick Edmondson £120, 2nd Calum Harris £60 and 3rd D Cox £20. Please will you make the usual announcement and thank everybody for their continued support. Bolton-by-Bowland Village Hall Whist & Dominoes Drive - April the 30th 2014 regretfully saw the last Whist & Dominoes Drive. They have been run 7 times a year but due to the declining numbers attending the difficult decision to hold no further was made by the Village Hall Committee. The Committee would like to thank all those who have come to the hall to play thus supporting the running of the hall and also to thank all who have helped to run these evenings giving their time & delicious baking! The May Cancer Research & December War Memorial events will continue as per usual. F.O.B.B.S - The FOBBS group (parents, friends and relatives of the School) would like to thank the following local businesses for their finicial contributions and support. Cricket club 100 Winners - Cricket club 100 club winners for Jan 2014 draw. Winners for last draw were 1st prize £250 Edward Aspinall 2nd prize £100 Mick Smalley and 3rd prize £50 Duncan & Gail Fielding. Thanks to everybody for their continued support. 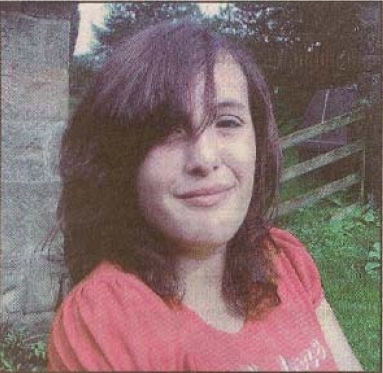 Twitter - Jan 2014 Bolton-by-Bolton join Twitter. 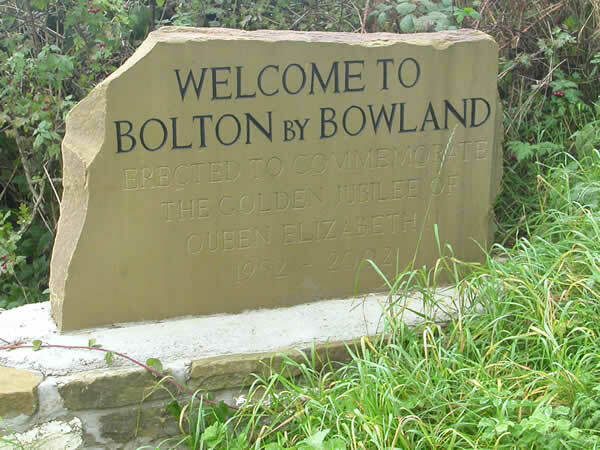 Follow us >>> Unfortunately some holding company has taken the full Bolton-by-Bowland name so we have had to settle with boltonbbowland which is the nearest we could get. Cricket club 100 Winners - Cricket club 100 club winners for April 2013 draw. Winners for last draw were 1st prize £210 number 32 Richard Drinkall 2nd prize £90 number 80 David Towler and 3rd prize £50 number 59 Karen Bottomly. Thanks to everybody for their continued support. Cricket club 100 Winners - Cricket club 100 club winners for Jan 2013 draw. Edward Aspinall won all three prizes in the January cricket club 100 draw. What are the odds of this happening? Edward has 5 numbers. The chances of the one of his numbers being drawn first is 5/100 Assuming that number does not go back in the bag the chances of him getting second prize is 4/99 and the third prize is 3/98. The probability of all events occurring is 5/100 times 4/99 times 3/98 = one in 16170. Sunday 2nd Sept 2012 - Eight local boys (known as ‘The Eights’) raised money for the NW Air Ambulance and Bowland Mountain Rescue. They completed a 12 hr 200k relay around Gisburn Forest (mountain biking) with a total mileage clocked up of 450k. The boys which include George Collins, Peter Cherry, Brandon O’Rourke, Max Bowen, Ben McGlynn, Seb Smith, Jake Stanworth and Zak Cottam are all local and attend Bowland High School. Up to the end of August 2012 - Twenty Three CLOSING DOWN SALE EVERYTHING MUST GO! 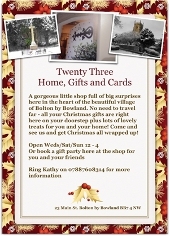 Lovely gifts and cards at half price.. Worth having a trip down for an early Christmas present or two. Cricket club 100 Winners - Cricket club 100 club winners for August 2012 draw were, 1st prize £120 Jeremy Collins 2nd prize £60 Karen Bottomley and 3rd prize R Edmondson £20 and thank everybody for their continued support. Bolton-by-Bowland set for television commercial - The picturesque village of Bolton-by-Bowland has been chosen for filming of a television commercial for one of the Olympic sponsors. Filming took place on Tuesday 15th May 2012. 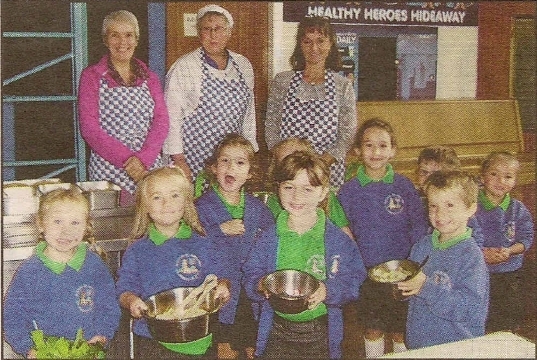 Click here to view pictures of the days filming in the village and to view the video commercial. Cricket club 100 Winners - Cricket club 100 club winners for April 2012 draw were number 62 Frank Baines £120, number 13 Matt Edmund £60 and number 15 Cath Curry £20. Nominations for King and Queen - Diamond Jubilee Celebrations. 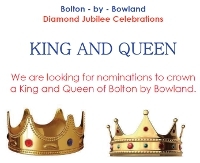 KING AND QUEEN We are looking for nominations to crown a King and Queen of Bolton by Bowland. 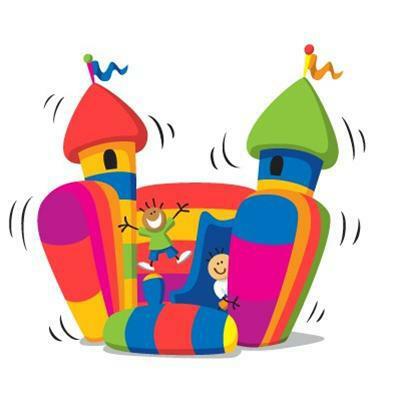 The King and Queen will be crowned at the start of the celebrations on Monday 4th June. Duties will include: Opening the celebrations in Lilburn’s Croft; Judging the children’s competition; Planting the commemorative tree; Sealing the time capsule; Click here to complete your nominations. Cricket Club 100 - Cricket club 100 club winners for Jan 2012 draw as 1st prize £240 Edward Aspinall; 2nd prize £120 Calum Harris and third prize £40 Lynne Porter >>> more details of the 100 club. 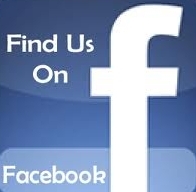 The Church of St Peter & St Paul on Facebook. Please click on the adjacent image to join us. Always secure your vehicle and apply the alarm if fitted. Ensure all windows are fully up and in a secure state. Do not leave keys in the ignition of any vehicles, including farm equipment. Remove all valuables from sight. Use a wheel lock or clamp to secure trailers. Lock and secure all outbuildings when not in use. Store equipment particularly quad bikes and trailers in outbuildings out of sight when not in use. 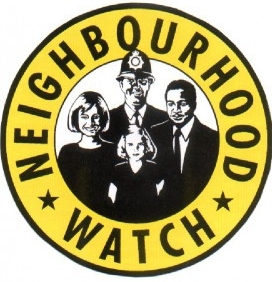 If any suspicious vehicles are seen hanging around in the area, please obtain their vehicle registration number and contact Clitheroe Police on 01200 458734. Mums take up great challenge - "OVERWHELMING" - that was how two Ribble Valley mums described the turn out for a quiz night held to kick start their fun -raising efforts. The event, held at Bolton-by-Bowland Village Hall, raised £1,800 for the joint causes being supported, CUC Sergeant children's cancer charity and Macmillan Cancer Support. Helen Hoyle and Melissa O'Rourke, both mums-of three, will also take on the challenge of the Great North Run on September 18th.